The high number of very young children who are homeless in Ireland is of grave concern, says the Society of St Vincent de Paul. Reacting to the publication of CSO census figures published on Friday 10 August, the SVP pointed out that children aged under four are now the single largest age group experiencing homelessness, with 765 children and babies in this age group recorded when the census was taken in April last year. 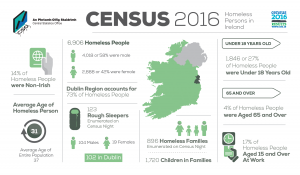 The figures highlight the rapid growth of family homelessness, says SVP social policy development officer Jennifer Thompson, who noted that there were 896 families recorded as homeless, accounting for 43 per cent of the total number of people recorded as homeless on census night. SVP members who visit families in emergency accommodation are reporting that families in such situations face complex issues, the SVP social policy specialist said. “Homelessness has a significant impact on health – both mental and physical. Families who present as homeless do not have control over where they are located, and the uncertainty of not knowing where you will be sleeping from one night to the next places extreme stress on an individual or family. The census also found that 12 per cent of the homeless population were unable to work due to permanent sickness or disability, in contrast to 4.2 per cent in the general population. Other notable findings in the census were that the rate of separation and divorce among homeless people is double that found in the general population. Homeless people are less likely to have third-level qualifications.